Thu., Feb. 22, 2018, 10:52 p.m.
STARKVILLE, Miss. – Teaira McCowan had 16 points and 18 rebounds, powering No. 2 Mississippi State to an 82-61 victory over Auburn on Thursday night. Victoria Vivians and Roshunda Johnson also scored 16 points apiece for the Bulldogs (29-0, 15-0 Southeastern Conference). Morgan William had 13 points. Auburn (13-14, 4-11) wasted a terrific performance by Janiah McKay, who scored 25 points on 11-for-21 shooting. Daisa Alexander had 14 points, and Unique Thompson finished with 12 points and 10 boards. LOUISVILLE, Ky. – Asia Durr had 13 points, and Louisville used its stifling defense to get the win. The Cardinals (28-2, 14-1 Atlantic Coast Conference) limited Virginia to 27 percent shooting and forced 21 turnovers. The Cardinals shot just 38 percent from the field, but earned their third straight victory by stifling the Cavaliers (16-12, 9-6), who shot just 8 of 40 from the field over the final three quarters. The Cavaliers’ turnovers led to 27 points for Louisville, which recorded 12 steals. Lauren Moses had 10 points and nine rebounds for Virginia, which has dropped five of six. The Cavaliers grabbed 17 offensive rebounds, compared to 11 for Louisville. SOUTH BEND, Ind. – Arike Ogunbowale scored 26 points, Marina Mabrey had 21 points, 11 rebounds and eight assists, and Notre Dame earned its 11th straight victory. Jackie Young added 12 points and 10 rebounds for the Irish (26-2, 14-1 Atlantic Coast Conference). Jessica Shepard had 11 points. Virginia Tech (17-11, 6-9) lost for the third time in four games. Aisha Sheppard scored 21 points for the Hokies, and Alexis Jean had 17. COLUMBIA, S.C. – A’ja Wilson had 27 points and a career-best 24 rebounds for South Carolina, turning in one of her most dominant performances in her final regular-season home game. The 6-foot-5 Wilson scored the first seven points of the game on senior night. The Gamecocks (23-5, 12-3 Southeastern Conference) never trailed. Raigyne Louis had 17 points and eight rebounds for LSU (18-8, 10-5). Chloe Jackson added 16 points. The Tigers scored 22 points off 14 turnovers and only gave away the ball five times, but they couldn’t overcome 32.8 percent (22-of-67) shooting from the field. TALLAHASSEE, Fla. – Nicki Ekhomu scored nine of her 17 points in the third quarter, helping Florida State to the runaway win. The Seminoles grabbed control by outscoring the Eagles 22-7 in the third quarter. The score was tied at 29 when Florida State pulled away with a 16-1 run, which included seven points by Ekhomu. Imani Wright scored 12 points while Shakayla Thomas and AJ Alix added 11 apiece for Florida State (23-5, 11-4 Atlantic Coast Conference), which led by as many as 29 in the fourth quarter. Alix also had a career-high 11 rebounds. Andie Anastos led Boston College (7-21, 2-13) with nine points. LOS ANGELES – Jordin Canada scored all of her 20 points in the second half, leading UCLA over Colorado. Canada also had 11 assists. It was her third consecutive game with 20 points or more. Monique Billings added 12 points and 11 rebounds for the Bruins (22-6, 13-4 Pac-12). Kennedy Burke made a 3-pointer from the right wing to break a tie and gave UCLA a 67-64 lead lead with 1:09 left. Canada made a pair of free throws with 27 seconds remaining to seal the win. Alexis Robinson scored 31 points for Colorado (14-14, 5-12). COLUMBIA, Mo. – Jordan Frericks had 16 points, 12 rebounds and nine assists, leading Missouri to its sixth straight victory. Frericks was 8 for 10 from the field in her 28th career double-double. Amber Smith hit five 3-points and scored 19 points for the Tigers (23-5, 11-4 Southeastern Conference). Cierra Walker scored 17 points for Vanderbilt (6-23, 2-13), which has lost six straight. Rachel Bell had 16. ANN ARBOR, Mich. – Katelynn Flaherty and Akienreh Johnson drained big 3-pointers late, Nicole Munger scored five of her 15 points in the last 28.1 seconds and Michigan held off Maryland. Flaherty and Johnson led the Wolverines (21-8, 10-6 Big Ten) with 17 points apiece. Johnson also had eight rebounds, three assists and two steals. Kaila Charles scored 27 points for Maryland (22-6, 11-4), which dropped into second place behind Ohio State. The Terrapins, the nation’s third-ranked 3-point shooting team, went 0 for 9 from behind the arc. GAINESVILLE, Fla. – Freshman Rennia Davis returned to her home state and notched her seventh career double-double, leading a balanced attack for Tennessee. Evina Westbrook and Jaime Nared had 13 points apiece for the Lady Vols (22-6, 10-5 Southeastern Conference), who gave coach Holly Warlick her 150th career win. Davis had 11 points and 10 rebounds. Paulina Hersler had 12 points for the Gators (11-17, 3-12). FAYETTEVILLE, Ark. – Chennedy Carter scored 21 points and Texas A&M scored its most points ever in a conference game. 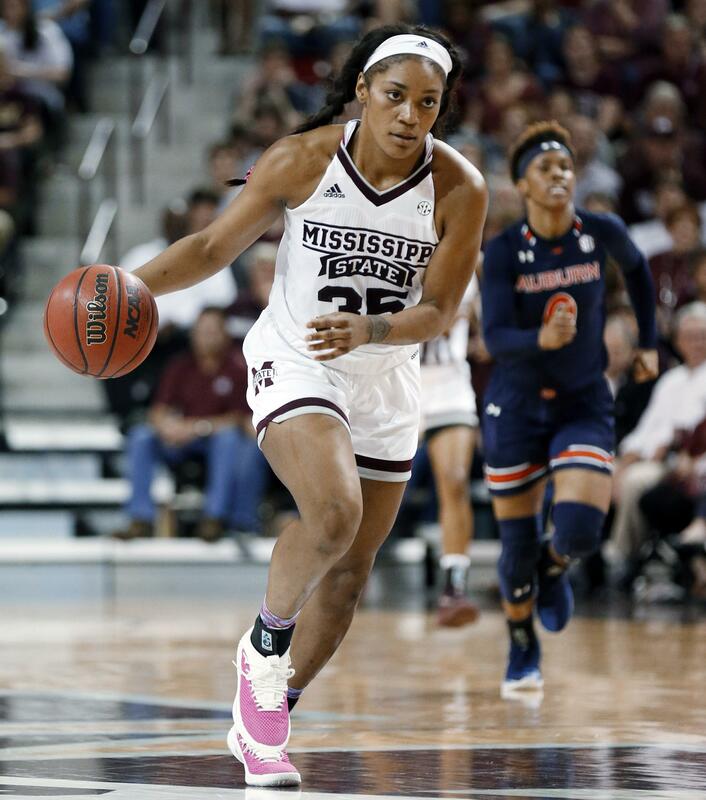 Jasmine Lumpkin had 17 points for the Aggies (21-8, 10-5 Southeastern Conference), and Khaalia Hillsman and Danni Williams each scored 16 points. Anriel Howard had 14 points and 14 rebounds. Arkansas shot 30 percent for the game. Jailyn Mason had 15 points. TUSCALOOSA, Ala. – Caliya Robinson had 12 points and 12 rebounds, including a putback with 3.2 seconds left in regulation, and Georgia edged Alabama in overtime. Gabby Connally had all five of her points in overtime, a 3-pointer to open the scoring and two free throws with 24 seconds left. The Crimson Tide missed all eight of their shots in the extra session. Mackenzie Engram led the Bulldogs (23-5, 11-4 Southeastern Conference) with 16 points and nine rebounds. Ashley Williams had 14 points and nine rebounds for Alabama (17-11, 7-8), which shot 24 percent for the game. PITTSBURGH – Chelsea Nelson scored a career-high 30 points on 10-for-13 shooting, and North Carolina State won for the 10th time in 11 games. Kaila Ealey added 12 points for the Wolfpack (22-6, 11-4 Atlantic Coast Conference), and Kiara Leslie had 11 points, eight rebounds and seven assists. Pittsburgh (10-18, 2-13) lost its fifth straight game. Yacine Diop scored 20 points for the Panthers, and Kalista Walters had 15. Published: Feb. 22, 2018, 10:52 p.m.